1. We had Isabelle’s baptism on Sunday, and it was absolutely wonderful. We had a great weekend leading up to it with our friends here from Virginia; the kids had a ball playing and it’s just so much fun to be together. 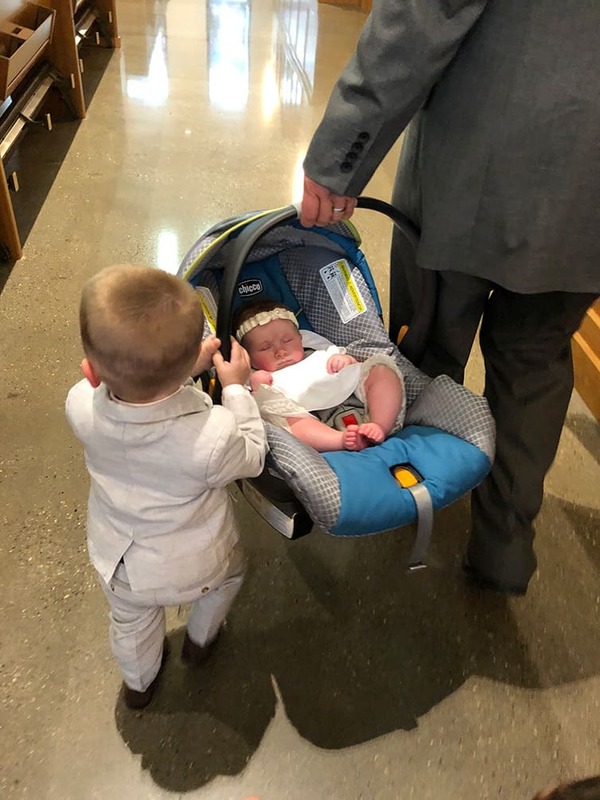 Isabelle, although crazy tired, held herself together remarkably well for the baptism ceremony, aaaaaaaaand then proceeded to scream the entire time we took pictures. Then she fell asleep in my arms :) She wore the same Christening gown that my sister and I wore, which was originally my mom’s. Kudos to my grandma and mom for keeping it in such immaculate condition! This was Isabelle’s headband – my aunt made it with material and beading from both my mom’s and grandma’s wedding dresses. This is the same aunt who has made framed cross stitches of photos of Joseph and Dominic by the Christmas tree on each of their first Christmases – she is incredibly thoughtful and talented. 2. I can’t believe that Joseph is going to be heading back to school in a few weeks! This summer has absolutely flown by, I can’t believe that it’s already been three months since he finished up. This year he’ll pick up an extra day (going three days a week instead of two) and an extra half hour (2.5 hours vs 2); he did so, so well with school last year and loved it so much, I can’t wait to see the friends he makes and everything he learns this year! I want to do something with Dominic, too. We do swim lessons once a week, but I’m debating between a music class and a tumbling class. 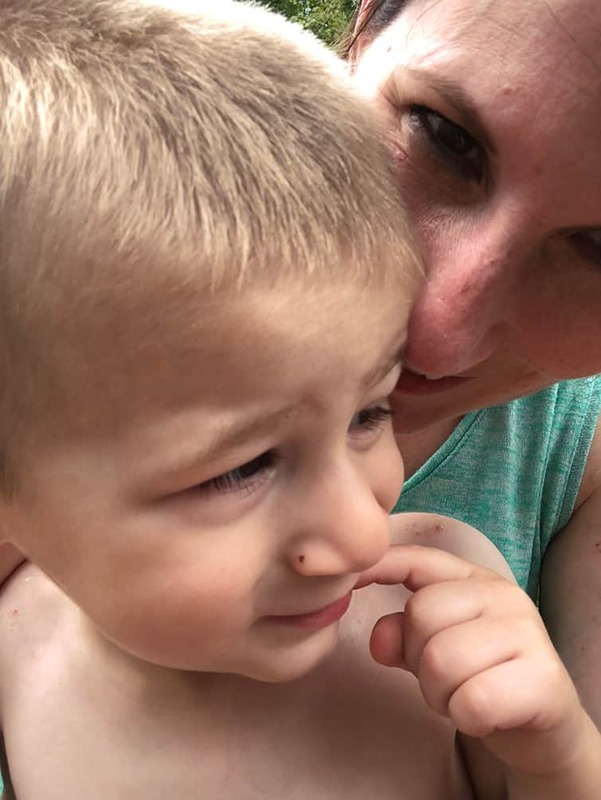 He didn’t totally love the music class we tried this summer, and he is a total monkey (he taught himself how to do somersaults! ), so I’m thinking he might like a toddler tumbling class. 3. Even though Joseph doesn’t need to pack a lunch for school yet (he only goes in the morning), I’m loving the back to school lunchbox guide from Sweet Peas Meals – tons of great ideas for meals and snacks at home, too! 4. All this talk about back to school has me craving the copycat Pizza Hut breadsticks; getting those BookIt personal pan pizzas was the best! 5. Last week or the week before I mentioned that I made my annual trip to the dermatologist and had two small moles removed. 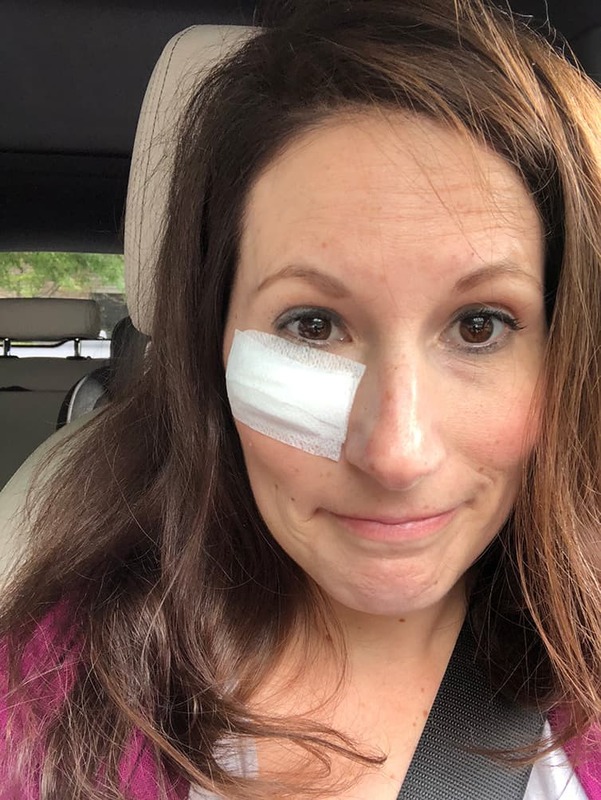 Well, the biopsy on the one under my eye came back as a basal cell carcinoma, so I had Mohs surgery performed this week. It’s basically a procedure (in the office) where they take a little more tissue from around the initial spot, and then examine the slides in a lab in real-time to see if there are cancer cells extending beyond the margin of the tissue that has been taken. If there are, they go back and take a little more. My mom and aunt have both had this procedure, so I was familiar with it. Sometimes it only takes one pass, but other times it can take three or more. I was fortunate in that they were able to remove it all with the first pass, so not TOO big of an area had to be removed. I’ve had a pressure bandage on since Wednesday and will remove it today, hopefully the scaring will be minimal. So, big-time PSA: get annual skin checks! I totally thought what they removed was an oil-clogged pore before I went in. 6. One of the things that I really, REALLY need to do is organize my digital files. They are all over the place. I need a streamlined system! Anyone care to share how they organize or a link to a system they’ve found helpful? 7. Crazy question – do you keep your raisins in the refrigerator or the pantry? I have always kept them in the pantry (we buy a big canister at a time) since they say to store at room temperature, but they tend to dry out. So one day my husband did some Googling and found a ton of sites saying to transfer them to an airtight container and store in the refrigerator. So I started doing this (using a freezer ziploc bag) and oh my gosh, they stay SO fresh and plump! Game changer! 8. I am SO ready for fall sports to get back in action! Pre-season football already started and hockey will start next month. Can’t come soon enough!! 9. Have you seen this recent Nature Valley ad about three generations of kids and what they did for fun? Absolutely heartbreaking. And just reaffirms how we feel about getting our kids electronics (yes, we will totally be the uncool parents, sorry kids). Glad to hear your Mohs surgery went well. I have had numerous surgeries and faithfully go to my Dermatologist every six months. Just had one taken off my forehead. Back for simple surgery, but all is well now. Good luck on your future. Just found your site lat night and am enjoying. Love all the recipes and links. Beautiful family. 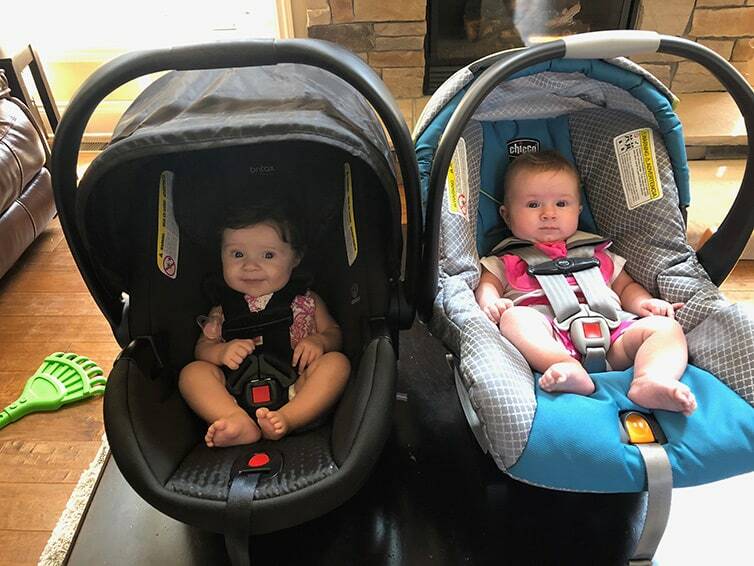 We had four children (all grown now and last one started her job in NYC last November). Goes by quickly. Didn’t realize you are from Pittsburgh. We are about 40 miles north of the City. Go Steelers! Oh I loved Bookit as a kid! Fond memories of lunch at Pizza hut with my family! I know this is a little late but I hope you and your boys are very careful with raisins and your dogs. They are just as deadly as grapes for dogs. Michelle, I am so sorry you had to have that spot removed. It is great you have gotten it taken care of. I also remember the Book It program and all that Pizza Hut pizza fondly. I do not store my raisins in the refrigerator but I almost exclusively eat Trader Joe’s jumbo raisin medley. It is a revelation as far as raisins are concerned. You are a great mom, and seem so well organized. Congrats on the baptism. I am happy all is going well with your health. I pray it will continue going that way. What a sweet and precious gift that your mom and great aunt made/done for your beautiful baby girl. the headband is a beautiful keeper. I love your Friday Things posts, Michelle! Always fun AND informative, too. I store my digital files by year and month. So the 2017 folder has 12 folders in it, one for each month. I’ve done it this way since the advent of digital photos (20+ years!) and it makes it pretty easy to find specific photos. It’s amazing to see how BAD the pictures were way back when! I will try putting my raisins in the refrigerator. We buy Sunmaid Organic, which taste like candy when they’re fresh, so I’m anxious to keep them that way!! Beautiful pictures of you, Isabelle and all of your family. You are so blessed! Beautiful pictures of everyone. How luck to have such talented people in your family. I love the cross stitch picture. Also, thank you for the tip on raisins. I am going to start doing that. As always, your pictures are awesome! That Isabelle is growing so fast! Looks like ya’ll had a great weekend! I think it is such a neat thing that you were able to put her in such a beautiful gown that had such a tremendous past! And that headband is absolutely gorgeous. You are so lucky to have such special women in your family! And I love the water balloons! I have never seen anything like that before – how cool! That Nature Valley video made me cry. It is so sad to think how we were always outside doing stuff compared to what these kids today do. I do not blame you one bit for your decision to limit electronics. I take my hat off to you – and those kids will thank you one day. Sorry about the melanoma – but thank goodness you paid attention! Praying for complete healing for you with very little or no scarring! Those balloons are called Buncho Balloons – we got them at Target and they were so cool! They fill up then seal themselves off and drop from the hose when they are full. So cool! She had a basil cell;not melanoma! What a great post. Oh, those PH breadsticks! So glad I don’t have one too close. The cross stitch picture is the coolest thing ever, I remember you posting that originally but it seemed to hit me more now and I want to do my dd pic in front of the tree when she was little. Probably a bit sentimental as we just dropped her off at college but I love that! Thanks for bringing that up again. Love the headband and the historic Baptismal gown. We did that with all the nieces in our family. Be the bad(GOOD) parents! We didn’t let our dd have electronics either and she has grown up wanting to be outside to play or play games instead of electronics. We did let her have them after she was firmly involved in activities on a limited basis. We saw a huge problem with that in COLLEGE! She transferred schools this year because at her previous school most of the students were content to stay in their rooms rather than participate in some of the great activities the school sponsored. It scares me for the future and how people interact. 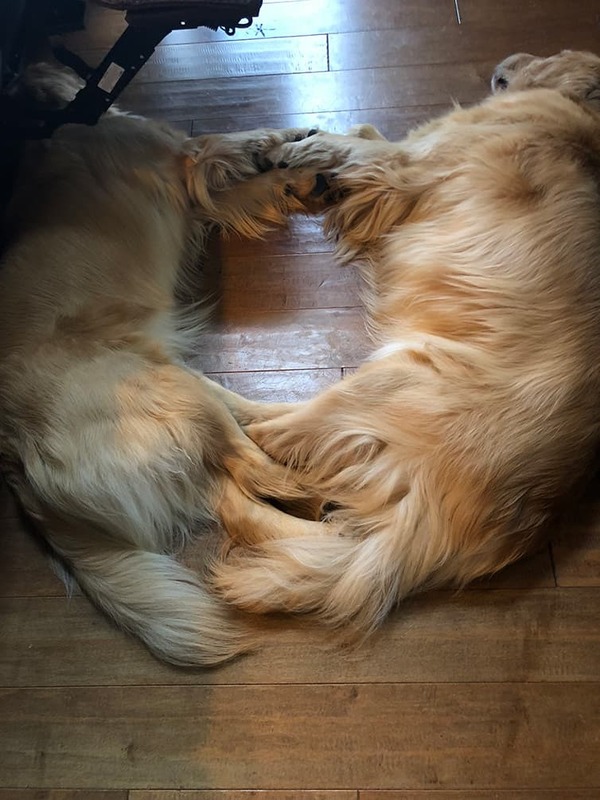 Great pic of the pups together. I love catching up with you on Fridays. 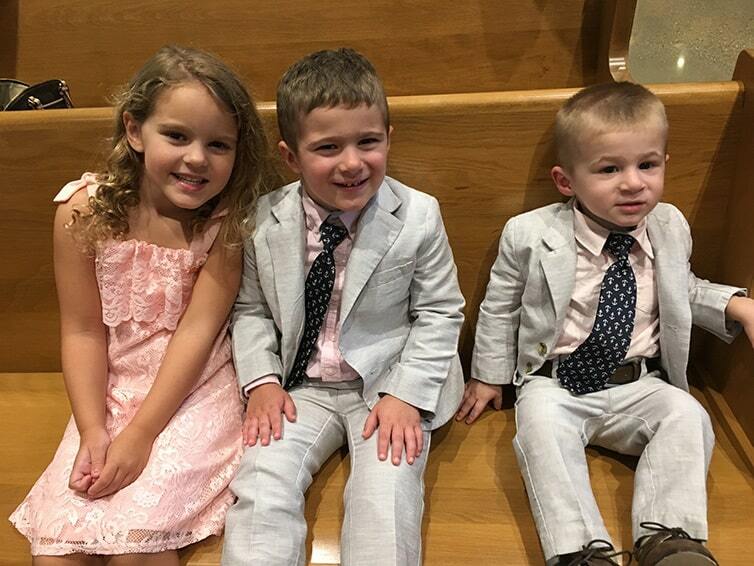 Your children are absolutely adorable and Dominic always makes smile. There is just something about that little one…. Glad you are ok with your skincare scare. I go for regular mole checks too and have been spending more time under the umbrella these days while at the beach. 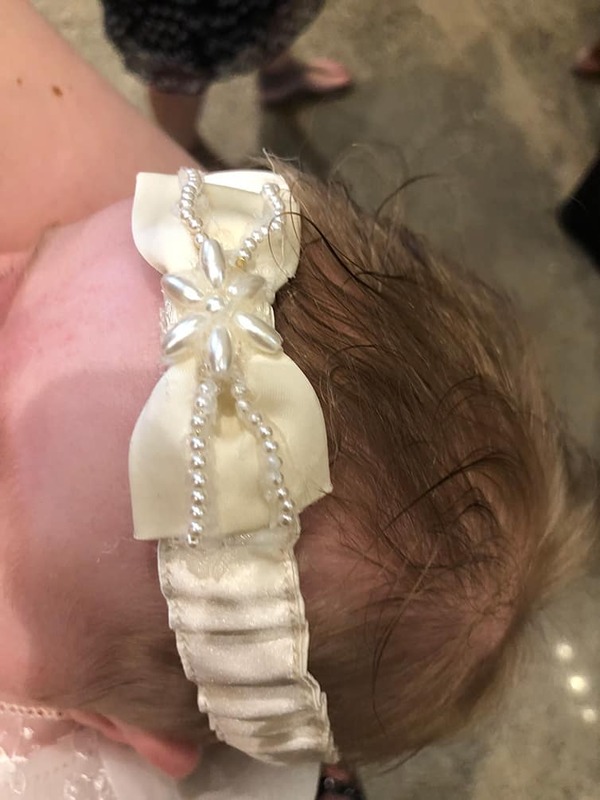 That dynamite color you chose for your outfit at Isabella’s christening was beautiful and the christening gown and headband are cherished heirlooms to be handed down to future generations. Keep doing what you are doing….you are on the right track! In this crazy world it is nice to come here and be part of something wholesome! Also, on computer organizing. I don’t know how you have things set up now but I treat it like I do the rest of my house – store like with like. So I have one main folder for recipes – and then there are sub folders for the different types (bread, cupcakes, appetizers, etc) – pick the categories that work for you. Each “topic” has a main folder and then I have sub folders within the main folder for each thing. Ex. “Family” is the main folder and then there would be a sub folder for each person/pet you have files for. Then whatever you save goes into it’s appropriate folder. This approach means I have just a few folders on the desktop proper but that I can easily find what I need with a few clicks. And once it’s set up it easy to maintain. This makes so much sense to me and I’m going to work on organizing my files soon! Thank you! Isabelle is such a darling little baby! Both of your joys were too. So nice that you have such a talented aunt – her crosstitch and the headband/bow are incredible. I’ve always found Polysporin to be helpful with scars – even old ones. Polysporin is like the cousin of neosporin – it’s sold in the same aisle but is slightly different. Off brands and Neosporin don’t work for scars – you have to get Polysporin (if you want to try it). Good for you for getting your skin checked! Your children are beautiful! I cant get over your Aunt making that headband for Isabella out of your mom’s & grandmother’s wedding gowns! Very talented woman. Thanks for sharing the Nature Valley video. That truly is heartbreaking. It really made me think about how much I’m on these darn devices too. I’m gonna put down this phone & get outside!!! I just went to my annual check this week too! I had a basal cell removed from in between my eye and nose 2 years ago. not so fun, I’m so hyper away of all my moles now! Just for the record, I am also an uncool parent. But my 4 & 5 year old know how to put a plant in the ground, the right time to pick a tomato, how to use a clipper to help prune a bush, and how to properly pick up a frog, a butterfly, and a grasshoper – and how to hold them so you don’t hurt them. So, I think it’s cool to be uncool. There is nothing more adorable than little boys in jackets and ties…a tiny look inot the future, ha! Isabelle looks so sweet in her special day outfit…and she is getting so big. On another note, I am interested to try the CopyCat bread sticks. We have a nearby restaurant, Fiorillos, that serves something similar. They make bread stick “things” that are super thin so that when they come out of the pizza oven , they are crispy and so delicious. Unfortunately, they only serve a small basket as a pre-order appitizer and I could consume about three baskets alone. 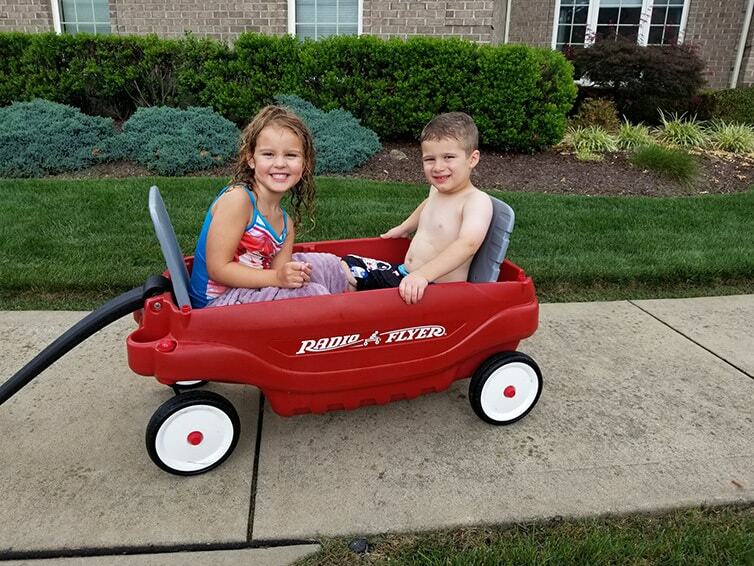 Great shot of Duke and Judith…so sweet you and your family were able to give each of them a special buddy. 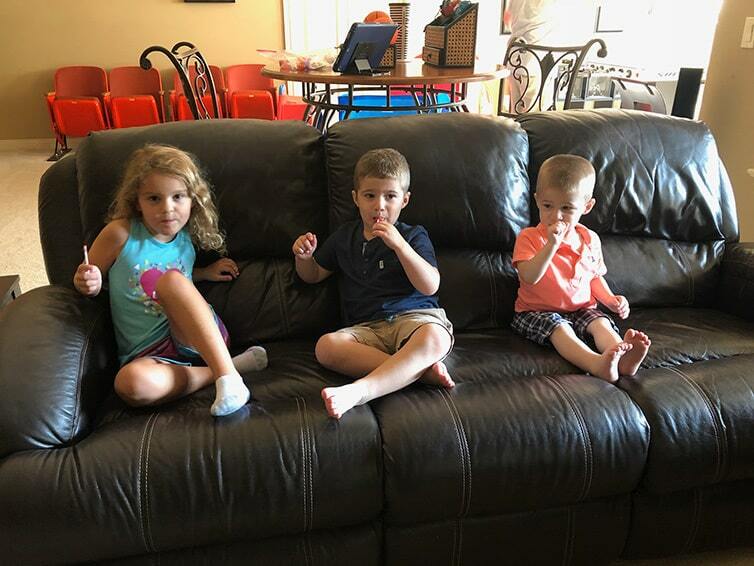 Your kids are just too cute! Are you familiar with Mederma? It’s an OTC gel in a tube which helps heal and minimize scarring. I had a nickel sized melanoma removed from my forehead. Started using Mederma once the stitches were out and it was fairly well healed. It’s been a year and it looks amazing. Can barely tell anything happened. Thanks for the rec, Tara! That was one of the ones the surgeon recommended. I have to wait a week or so to start massaging and using the scar creams. I always wait for my Friday morning email so that I can see what is going on in your sweet little family! I keep raisins in the pantry…but, make sure that the dogs don’t ever have raisins or grapes because they can make them very sick. 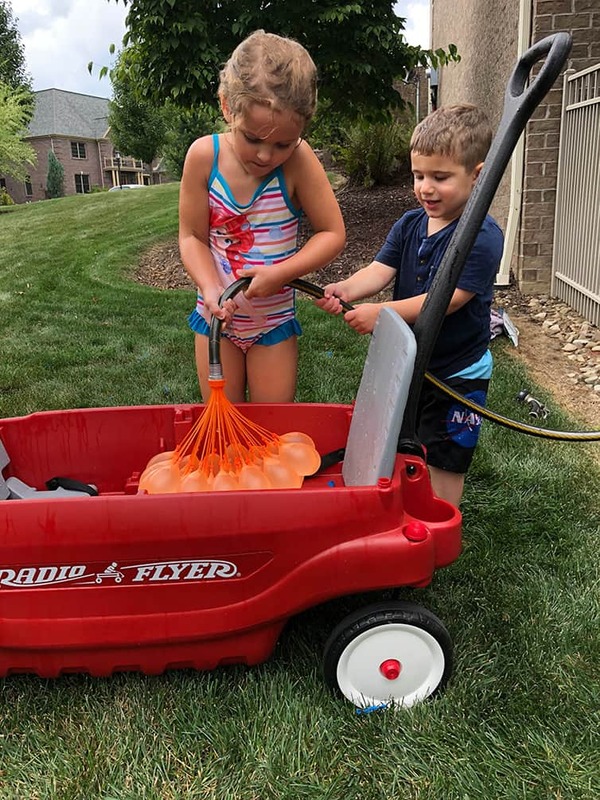 My husband and I are on the same page as you with limiting screen time and making sure our boys (4.5 and 15 months) spend time DOING stuff with us, each other, and outside as much as possible. So we’ll join you at the uncool kids table if that’s all right. Also, and I know this was just an honest mistake, but you misspelled “scarring” by spelling it “scaring” and it’s still accurate so maybe we’ll just call it a Freudian slip. :) Anyway, it made me laugh to read what you actually wrote vs. what was intended. Thanks for the PSA though. I have had a derm appointment on the to-do list for, oh, 5 years by now? I really need to make it happen. OMG such a beautiful family!! I just love reading your posts and have never commented before. Thanks for the PSA of the all over body scan – going to make an appointment now! I’m so sorry for your loss Trish, I know how difficult it can be to lose a beloved pet. We lost our oldest nearly two years ago and still miss him like crazy! So glad you caught your basal cell early. 10 basal cell spots and 2 Mohs later, I get checked every 6 months. Go get an annual skin exam folks! And don’t forget to wear sun protection on your lips – that is what I’m dealing with now. People forget to protect their lips and it is one of the most common (and most painful) areas for skin cancer. 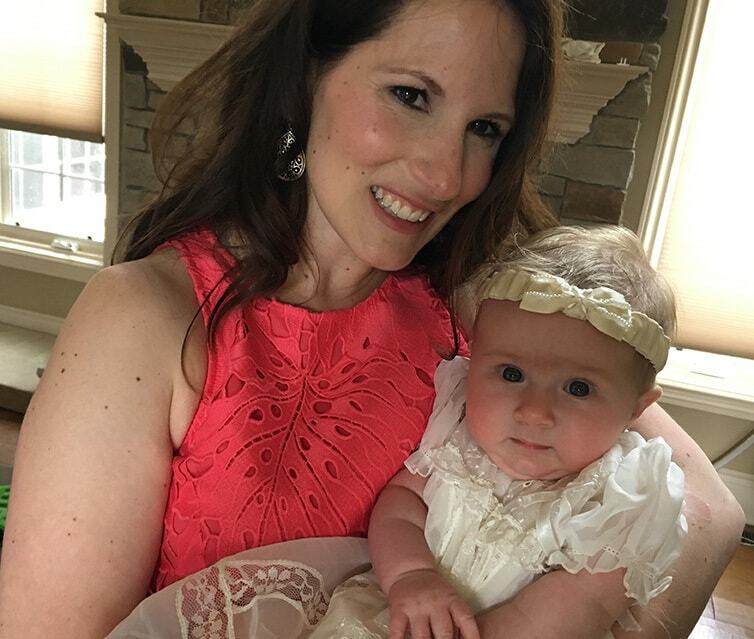 Great picture of you and Isabelle – the christening gown is gorgeous. Looks like the kids had a great weekend. Your aunt is incredibly talented! The Nature Valley ad is scarily accurate about what’s going on. We have got to unplug our kids and let them actually experience life! Have a good weekend! What a lovely picture of Isabelle in her little batism outfit. And the boys look so cute with their suit and ties on!! So ADORABLE!!! I watched the video and I have to say it really was sad to watch it. I grew up in the 70’s and loved my childhood. I loved playing outside. Climbing trees, riding bike, playing tag or freeze tag, hide and go seek, hopscotch, Red light green light 123, I know there’s more but these are the only things that I can remember. Life was so much fun back then. It’s not the same with kids today. There’s so much that they’re missing out on. Not to be mean or critical I’m only trying to make a point, when I was younger, there was always that one kid in class who was overweight. It was only 1 kid. Today you see so many overweight kids and teens. No one uses their body to play and have fun. All they do is play video games and text. It’s pretty sad. Just saying…..
I’m SO glad that you’re ok – I’m going for my annual skin check next week and never love it, but so necessary.